At a time when Facebook, Twitter and LinkedIn are pushing people to put forward their most polished, put-together selves, a new class of mobile applications aims for a bit more honesty. Among the latest is Secret, created by two former Google engineers who were looking for a way to let people deliver genuine feedback to co-workers. With the app, friends and friends of friends can share their deepest and darkest thoughts, along with gossip, criticism and even plans to propose marriage, under a cloak of near-anonymity. "This idea that you have to craft this perfect image online," says Secret's 30-year-old co-founder Chrys Bader-Wechseler. "That's stressful. We want to remove that stress." Secret joins a handful of apps such as Confide, Whisper and Yik Yak that have become popular - and in some cases, notorious - in recent months, by offering users a way to communicate while cloaking their identities. What happens when people are free to say what they want without a name and profile photo attached? It's an experiment in human nature that harkens back to the early days of the Web, when faceless masses with made-up nicknames ruled chat rooms and online message boards. In the past decade, anonymity has been fading. As Facebook soared to dominate online social networks, the trend shifted toward profiles, real names and the melding of online and offline identities. But as people's online social circles grew from friends to parents, grandparents, in-laws, colleagues and bosses, many became increasingly reluctant to share as openly as they once did. "People go on Facebook and say they just got engaged. But what you don't see is I am going to propose today,'" says Secret co-founder and CEO David Byttow, 32. Launched in 2012, Whisper is especially popular with teenagers and 20-somethings, with the bulk of its users under 24. Yik Yak, released late last year, made headlines recently when a California high school went into lockdown after someone used the app to post an anonymous bomb threat. Although anonymity apps are being criticized as platforms for bullying, supporters say they can be tools for preventing mischief. They also have a cathartic value for some users. "My baby boy passed away recently. I saw his picture today and cried. I cried because I love him and miss him. I'm a guy, so no one thinks to talk to me," read a recent post on Secret. Another recent Secret message read: "Fact: It's downright scary to hire your first woman onto an all-male team." 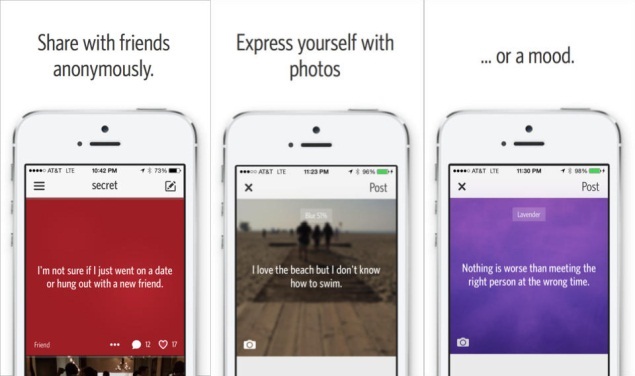 On Secret, users are told when a friend has posted a secret - they just don't know which friend. Whisper, meanwhile does not tell users how, or if, they are connected to a person posting. "I am a closeted gay guy and the sheer number of hot fraternity guys on campus is a special kind of hell," read a recent post on Whisper. Whisper CEO Michael Heyward, 26, says the company's app does not allow people to "use anonymity to hurt anyone else." Users, for instance, can't put proper names into posts unless the names belong to public figures. So Justin Bieber is okay. Justin from Spanish class is not. Whisper also employs 120 human moderators to comb through posts in real time. "There is no safer space," Heyward says of Whisper. The company announced a partnership with media site BuzzFeed on Monday, in which BuzzFeed writers will use content posted on Whisper as source material for articles. The deal, reported in the New York Times, does not have a financial component. Secret, meanwhile, has been especially popular in Silicon Valley and its satellite technology communities outside of the San Francisco Bay Area. Startup gossip - from personal attacks on company founders and venture capitalists to acquisition rumors that turned out to be false - has been a mainstay of Secret in the less than two months since its launch. Secret tries to add a layer of accountability to anonymous posts by showing users' secrets to their friends and allowing only friends, or friends of friends, to comment on each shared post. Bader-Wechseler is quick to point out that the app is not exactly anonymous. Anonymish, maybe. To sign up, users can provide their mobile phone number, email address or both. 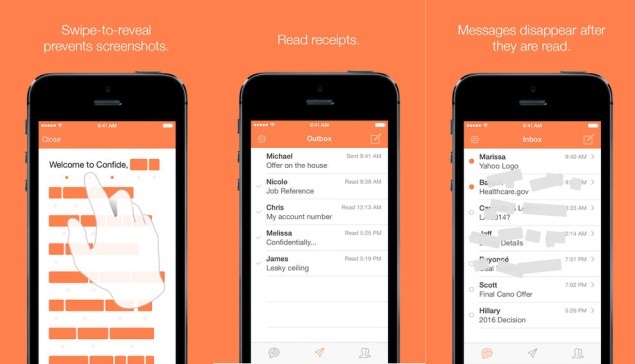 When you post a secret, your phone and email contacts who are also on Secret will be able to see it. If they tap a heart icon indicating that they "love" your secret, then their friends will be able to see it too. You won't know which of your friends is on Secret. Secret says it ensures security by encrypting posts and without uploading contact information to its servers. The app also offers a panic button of sorts, called "unlink my posts." When a user clicks it, any link between them and all previous secrets they have posted is removed. Katy Nelson, an early user of the app who heard about it from a friend who works at Secret, says she finds herself commenting on posts more than sharing secrets herself. This is especially true "when I see secrets where people are being really vulnerable, asking for advice about a relationship, substance abuse," she says. "The ease of honesty that anonymity gives you is really cool," says Nelson, who works for a nonprofit group in Washington DC. She acknowledges that such honesty would not be possible on Twitter or Facebook. "The stakes on a public platform with your name attached are just higher," she says. "It's not safe to be brutally honest, or make yourself really vulnerable." Online anonymity is often synonymous with bullying, harassment and nasty comments. That's why sites from YouTube to the magazine Popular Science and Huffington Post have moved away from anonymity in recent months. But Heyward and Byttow argue that the new apps are different, filling a need for honesty that's only possible when identity is stripped away. "Even though we are sharing more online than ever before, I think we have become more guarded," Heyward says. "It's like people are living their digital lives in front of a window. No one is not going to show their best self.Identity can feel sort of shackling, But if you remove that, it can lead to intimacy." But Steve Jones, a professor who studies online culture and communications at the University of Illinois at Chicago, believes there's a "significant degree to which people want to be associated with their words," get comments, likes and acknowledgements for them. Anonymity apps, he says, could have a difficult time maintaining a business model because they are exposing themselves to a lot of liability. "I don't want to dismiss the optimistic view that the makers of these apps have," he says. "But I don't have that much evidence yet that these apps are appealing for a better nature."